Cambridge University Press, 1987. Cloth. Fine/Fine. 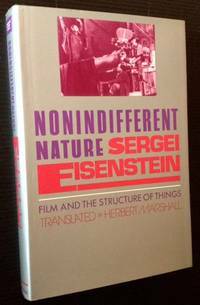 A pristine copy of the 1987 1st English language edition, translated from its original Russian by Herbert Marshall. Clean and Fine in a bright, Fine dustjacket. Octavo, 428 pgs. Cambridge University Press, 1987. Cloth. Fine/Fine. 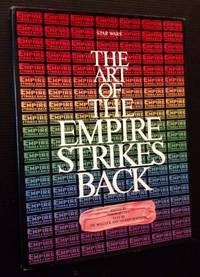 A pristine copy of the 1987 1st edition. Tight and Fine in a bright, Fine dustjacket. 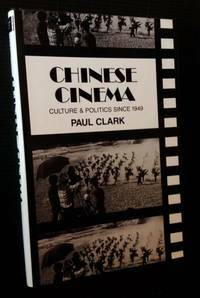 Octavo, "the first comprehensive history of film in China from the establishment of the People's Republic in 1949 to the mid-1980s, when a 'new wave' broke in Chinese cinema." (from the dustjacket's front flap). South Orange, New Jersey: The Michael Rennie Club, 1966. Original wraps. Near Fine. 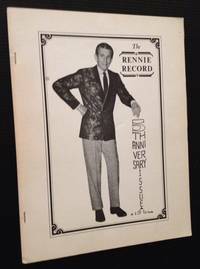 Charming mid 60s fan club literature, in this case devoted to the actor Michael Rennie, who will of course always be remembered for his starring role in the classic science fiction film "The Day the Earth Stood Still". Surprisingly deatiled and elaborate --and published with the full blessing of Michael Rennie himself, who here writes in, thanking all his fans for their interest in him. Quarto, 49 pgs., including a number of tipped-in black-and-white photos of Rennie in various roles on the stage and in film. Tight and Near Fine in its pictorial wrappers, with one tiny stain ot the front panel. The 5th anniversary issue, October 1966. Wonderful throwback to a much more innocent time in celebrity adoration. Los Angeles, 1980. Original wraps. Very Good. 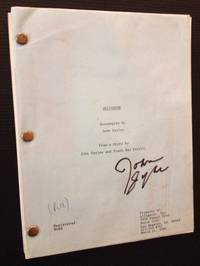 The March 1980 1st iteration of John Sayles's screenplay (with its multi-colored paper) , SIGNED BY JOHN SAYLES in magic marker on the front cover. Solid and VG in its light-blue wrappers, with light soiling to the panels. "Property of Alligator, Inc.", from a stroy by John Sayles and Frank Ray Perilli. Diletante Press/Kesho Press, 2000. Original wraps. Fine. INSCRIBED (AND INITIALED) BY THE AUTHOR ERNIE WOLFE, III on the verso of the dedication page. A pristine copy to boot of the 2000 1st paperback edition. Clean and Fine in its stiff pictorial wrappers. Tall quarto, hundreds of vivid color illustrations thruout. LUCASFILM, LTD. (Ballantine Books), 1980. Cloth. Near Fine/Fine. A crisp, virtually pristine copy of the much less common 1980 1st hardback edition. Tight and Near Fine (with one tiny smudge at the front free endpaper) in a bright, price-intact, Fine dustjacket. Tall quarto, impressive, richly-colored illustrations thruout. 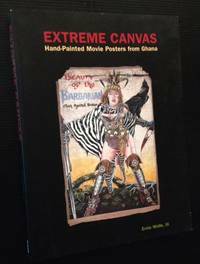 Edited by Deborah Call, art direction and design by Vigon, Nahas, Vigon. Brussels: A. Bieleveld, 1922. Original wraps. Very Good. INSCRIBED BY MAURICE WIDY IN YEAR-OF-PUBLICATION on the dedication page. A solid copy to boot of the 1922 1st edition. Tight and VG in its pictorial wrappers, with photographic paste-on to the front panel. Somewhat pronounced foxing along the panels (especially the rear panel) and light wear at the spine. Former owner name as well at the front free endpaper. Still though, very presentable. Octavo, issue #1 in the wonderful "Bibliotheque des Sciences Cinegraphiques" series, published in Brussels. Paris: Pathe Freres, 1919. Original wraps. Very Good +. Hebdomadaire. 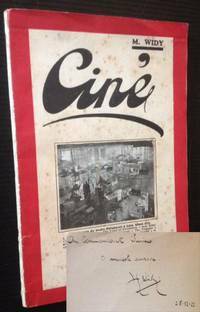 An impressive crop of 33 issues of this early, very uncommon Parisian trade magazine, issued by "Pathe Freres", one of France's (and the world's) leading film production companies at the time. 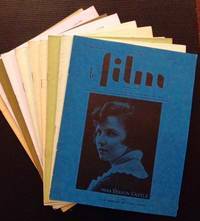 Spanning 1918 and 1919 (the magazine's 5th and 6th years in existence), this weekly (and sometimes bi-weekly) offers a detailed, very sophsiticated look at mostly the world of French film and cinematography but also covers the world of French theatre, concert-going and music halls. Crisp black-and-white photos run thru each issue, as does wonderful multi-colored typography and design. Magazine-formatted, uniform, tall quartos in their stapled, pictorial wrappers. A razor-thin, innocuous crease running vertically along all of the front covers; otherwise, each issue is clean and crisp and easily VG+ to Near Fine. Internally immaculate as well, with no writing or markings to any of the issues. One of the great undertakings in early French (and international) cinema. New York: Harper & Brothers, 1922. Hardcover. Very Good/Very Good -. 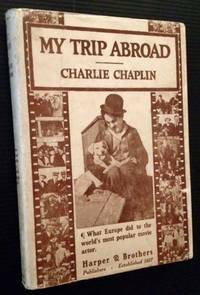 The 1922 probable 1st edition (with the Harper & Brothers "B-W" code on the copyright page, denoting February 1922 publication date), IN THE UNCOMMON PICTORIAL DUSTJACKET. Tight and VG/VG+ (with light offsetting at the front gutter) in a bright, price-clipped, VG- dustjacket, with soiling to the rear cover as well as a tape ghost and a 2" chip along its bottom-edge. Still though, presentable and attractive. Octavo, 155 pgs., including black-and-white photos thruout. 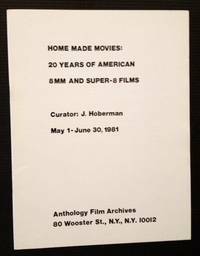 New York: Anthology Film Archives, 1981. Original wraps. Fine. A pristine copy of this important 1981 catalogue. Crisp and Fine in its stapled, printed white wrappers. Quarto, Foreword by the formidable Jonas Mekas. Paris: Editions Universitaires, 1961. Original wraps. Very Good +. 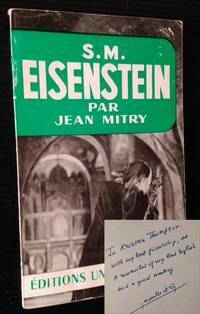 INSCRIBED BY THE AUTHOR JEAN MITRY on the front free endpaper. A very solid copy to boot of the 1961 1st edition. Tight and VG+ in its pictorial wrappers, with just a touch of rubbing along the front panel and light creasing to the spine. Several pages as well of ink underlining at the rear. 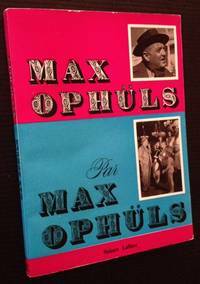 16mo, the 4th volume in the wonderful "Classiques du Cinema" series issued by Editions Universitaires. Warsaw: Wydawnictwo, 1930. Hardcover. Very Good -. Uncommon 1930 Almanac of Polish film. This copy includes several interesting institutional stamps/plates. De-accessioned from the "Library of the Department of Commerce" (bookplate at the front pastedown) and 2 "Commercial Intelligence Division" stamps (one on the front panel, the other on the front free endpaper). Institutional tag as well at the foot of the spine and library pocket and stamp to the rear pastedown and endpaper respectively. (Clearly, this copy had to go thru some bureaucratic channels to become available.) Solid and VG- in its pictorial covers, with light chipping at the front tips and light soiling along the rear panel. Photographs and maps thruout. 12mo, 503 pgs. London: Studio Vista Ltd, 1967. Original wraps. Very Good. 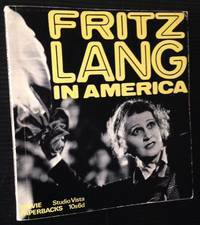 WARMLY INSCRIBED BY FRITZ LANG on the half-title. 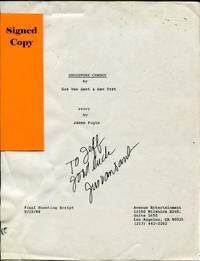 A solid copy to boot of the 1967 1st wrappered edition. Tight and VG, with light creasing along the spine and very small bookseller stamp at the half-title. 16mo, part of the wonderful Studio Vista film series issued out of London. University of Cincinnati, 1968. Original wraps. Very Good +. 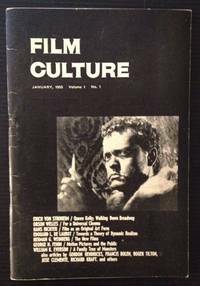 The 1968 first issue of University of Cincinnati's "Perspectives on American Underground Film", called "Cinema Now". Tight and VG+ in its stapled wrappers, with just a bit of rubbing to the rear panel. 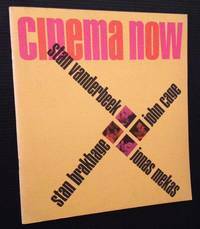 Octavo, this maiden issue features a symposium with 4 of the leading figures of American underground film: Stan Brakhage, John Cage, Jonas Mekas and Stan Vanderbeek. Paris: Robert Laffont, 1963. Original wraps. Very Good +. A crisp, sharp copy of the 1963 1st edition. Solid and VG+ in its pictorial wrappers, with small name and date at the title page. 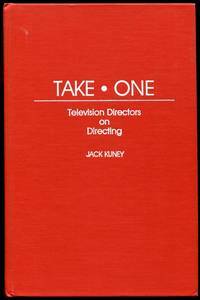 12mo, 238 pgs.crisp black-and-white photos charting the great director's career. 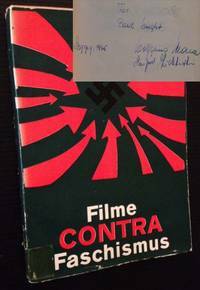 Berlin: Staatliches Filmarchiv Der Deutschen Demokratischen Republik, 1965. Original wraps. Very Good -. SIGNED BY BOTH AUTHORS (WOLFGANG KLAUSE AND MANFRED LICHTENSTEIN) in year-of-publication on the front free endpaper. A solid copy to boot of the 1965 1st edition. Tight and VG- in its pictorial wrappers, with clean, neatly-applied tape along several of the edges and light wear and chipping along the spine and to the panel edges. Octavo, grim black-and-white images thruout. New York: Greenwood Press, 1990. Cloth. Near Fine. A very sharp copy of the 1990 1st edition. Tight and Near Fine in its orange cloth. Octavo, 177 pgs. #25 in Greenwood Press's "Contributions to the Study of Popular Culture" series. London: Hamish Hamilton, 1953. 1st. Cloth. Collectible; Very Good/Very Good. 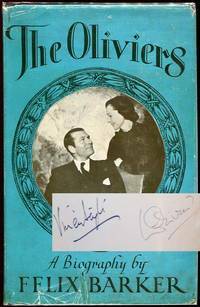 SIGNED BY BOTH LAURENCE OLIVIER AND VIVIEN LEIGH UNDERNEATH THEIR FRONTISPIECE PORTRAIT AND VERY UNCOMMON AS SUCH. A clean, solid copy to boot of the 1953 true 1st edition. Tight and VG+ (with light foxing at the edges and the preliminaries) in a bright, price-intact, VG- dustjacket, with creasing at the front panel's lower-edge, light wear to the spine ends and a degree of soiling along the rear panel. Still though, attractive and very presentable. Octavo, 313 pgs., including crisp black-and-white photos thruout.